Tim Morehouse, a silver medalist in team fencing at the 2009 Summer Olympics in Beijing, didn’t always feel a drive to excel. As a kid, he lacked focus and ambition. But fencing, he now says, gave him the resources and the inspiration to dream big. He regards fencing—with its focus on discipline, practice, patience, and seeing the big picture—as a metaphor for meeting the essential challenges of life. Today Morehouse is a social activist and entrepreneur. His mission is to take fencing out of its elite milieu and to make it widely accessible to children and adults everywhere.1 Children, he points out, encounter images of sword fighting in many forms of entertainment. He wants to use that familiarity with the sport as a way to spark an interest in fencing among kids—disadvantaged inner-city boys and girls, in particular. Fencing, he believes, can nurture qualities that will help those kids grow into successful adults. When Morehouse set out to realize this goal, he knew that he faced huge obstacles. The cost of the equipment needed for a school to maintain a fencing program, for a gym to offer fencing, or for an individual to take up the sport, is often prohibitive. And few physical education teachers have the training that fencing experts believe is necessary to teach fencing or to coach a fencing team. Morehouse engaged IDEO, a firm that specializes in design thinking, to help him create fencing equipment that would meet several criteria: It had to preserve the essence of the sport. It had to be inexpensive enough to keep cost from being a barrier to entry. And it had to be simple enough to use that teachers who are relatively unfamiliar with the sport could easily adopt it. The design thinking process at IDEO resulted in prototype equipment items that largely met Morehouse’s goals. Standard fencing equipment, for example, includes a cord that runs from each fencer to a scoring machine—a feature that costs several thousand dollars. IDEO designed a relatively inexpensive system that syncs each player’s foil electronically to a scoring mechanism. But members of the fencing establishment didn’t hail Morehouse as a savior of the sport. Nor did they embrace the equipment innovations that he had developed. They argued that those innovations would mark a departure from “real fencing” and suggested that only people with years of training could teach the sport. They regarded his efforts as a threat, and they moved to thwart his project. Morehouse was flabbergasted. He had the makings of a solution that would bring their sport to disadvantaged young people. What was the problem? At this point in his journey, Morehouse happened to sit next to Marty Linsky (one of the coauthors of this article) on a flight from San Francisco to New York City. That serendipitous encounter led to a series of conversations between Morehouse and Linsky about the practice of adaptive leadership. When Morehouse looked at the problem from an adaptive perspective, he realized that for many people who care deeply about fencing, his project represents the potential loss of a cherished and comfortable environment. Although many of these people give lip service to the goal of increasing participation in the sport, they are wary of relinquishing the sense of exclusivity that fencing provides. Morehouse used the tools of adaptive leadership to develop a new approach to engaging with the people and organizations that embody the values of exclusivity in fencing. He now understood that the fencing establishment could impede, or even derail, what he is trying to accomplish. Morehouse began to appreciate the sense of threat that they were experiencing, and he adjusted the pace of his work so that it wouldn’t seem overwhelming to them. He listened to them, tried to accommodate their concerns whenever he could, and modified his behavior so that he would come across less as a crusader than as an embodiment of their expressed desire to see fencing thrive. Then he returned to IDEO and resumed work on developing innovative, cost-effective equipment. Slowly but steadily, he began to collaborate with willing members of the fencing establishment to pursue the changes that he believed would increase the reach of the sport among young people. He attracted favorable publicity to his project, and he held a few well-attended fencing exhibitions—steps that demonstrated his ability to generate immediate benefits for the sport. Morehouse launched the project less than three years ago, and already it has come a long way. His efforts have brought fencing to more than 15,000 schoolchildren, most of whom attend schools in low-income areas. He and his team have trained 115 physical education teachers to teach and coach the sport. More than 50 schools in nine US states now offer fencing for the first time ever. This school year, more than 5,000 kids in New York City alone will take part in fencing activities that include both new after-school programs and new varsity teams. Design thinking and adaptive leadership are two well-regarded forms of organizational practice—two powerful approaches to leading systemic change. Each area of practice reflects the environment from which it emerged and in which it flourishes. Design thinking, a product of the West Coast, is optimistic and playful, sunny and casual, innovative and entrepreneurial. Adaptive leadership, born on the East Coast, is pragmatic and severe, somber and formal, highly established and highly “Establishment” in its orientation. We can trace the origins of design thinking to the work of Herbert A. Simon, a social scientist and Nobel laureate who referred to design as a “way of thinking.”2 But over the past 25 years, this practice has become closely associated with the Hasso Plattner Institute of Design at Stanford University (commonly known as the d.school). Practitioners in fields that range from aviation to health care come to the d.school to learn about the practice. Adaptive leadership, meanwhile, originated at Harvard University’s Kennedy School. There, people from a diverse array of fields and roles—current and future politicians, policy makers, and executives—take lessons on how to lead adaptively. Each practice area has a prominent institutional home: IDEO, a global design thinking firm based in Palo Alto, Calif., and Cambridge Leadership Associates, a consulting firm in New York City that bills itself as the mother ship of adaptive leadership. One of us, Maya Bernstein, has experience in the practice of design thinking. The other, Marty Linsky, has a background in the practice of adaptive leadership. (Linsky collaborated with Heifetz on two books that expanded on the latter’s first book about leadership.7) In our work, both separately and together, we have found that neither approach provides a complete solution to many of the problems that we encounter in working with clients. Design thinking work is exciting, fast-paced, and highly accessible. But in many cases, it fails to produce deep changes in the norms, values, and behaviors that underlie a given design challenge. Adaptive leadership work is gritty, honest, and complex, and it carries the potential to make a lasting impact on the human dynamics that affect an organization. All too often, however, people experience this practice as emotionally exhausting and excessively negative in spirit. It can reveal the proverbial elephant in the room, but it offers few tools for taming the beast. At the same time, we have noticed that design thinking and adaptive leadership can complement each other in useful—and, indeed, profound—ways. We aren’t the first observers to note the potential for synergy between design thinking and adaptive leadership. Chris Ertel and Lisa Kay Solomon, in their recent book Moments of Impact, point to the benefits of weaving together these two approaches. Designers today, they say, must “navigate their way through a world of adaptive challenges.”8 In our work, we have taken this insight further by exploring theoretically how each area of practice can best complement the other. We have also started to test ways to synthesize the two practices. Inspired by our work with change agents such as Tim Morehouse, we are developing an approach that integrates design thinking and adaptive leadership into a single, seamless method of managing complex change projects. We call this approach adaptive design. It builds on the work of people who pioneered those two established practice areas, and it flows out of our experience in helping people and organizations deal with a wide range of seemingly intractable challenges. It also stems from our recognition that a deep synthesis of the two disciplines can facilitate greater progress than either of them can achieve on its own. In design thinking, practitioners use the principles of human-centered design to solve problems in the business, social, and educational sectors. Human-centered design places people at the center of the design process. This approach originated in the field of product design, and it starts with a simple principle: If you design a chair, design it for the person who will sit in it for eight hours a day. More recently, design thinking practitioners have begun to apply this method to services (such as low-cost health care) and to organizational improvements (such as better schools). 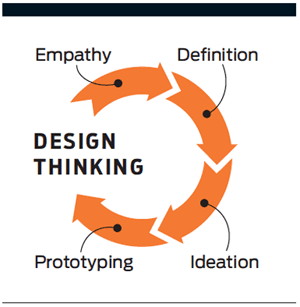 Design thinking is an iterative process that includes four steps: empathy, definition, ideation, and prototyping. The purpose of the first step, empathy, is to gather insights about the true needs of users or beneficiaries. Consider a classic example of the design thinking process. In 2007, a group of Stanford students were charged with redesigning an infant incubator for use in developing countries.9 They traveled to Kathmandu, Nepal, and visited the neonatal units of hospitals there. Instead of immediately trying to design a new incubator, the student team spent time observing women in local communities, talking with them, and working to understand their lives. This process resulted in a critical insight: Most premature Nepalese infants were born in rural areas and never made it to a hospital. The next phase of design thinking, definition, involves reframing a challenge on the basis of insights that emerge from the empathy phase. During this phase, designers generate language that serves two purposes: It helps concretize the challenge, and it recasts the challenge as an opportunity. An integral part of this process is the use of “How Might We” questions. In the incubator redesign project, the students changed their framing of the challenge from “We need better hospital incubators for premature babies” to “How might we save the maximum number of premature babies’ lives?” Through this technique, design thinkers simultaneously identify root problems and create an opening for creative solutions. In the following two modes, designers mobilize untapped wells of creativity to generate ideas that they can test quickly both for impact and for feasibility. In the ideation phase, designers produce as many ideas as they can muster. Here, quantity trumps quality, and the hope is that exploring silly, wild, or unlikely ideas will lead to ingenious ones that just might do the trick. In prototyping, designers work quickly to create mockup versions of a product or service. The goal at this point is to gauge how a given innovation affects users. Through prototyping, the Stanford students arrived at an idea that resulted in the Embrace Incubator—a light, small device that looks like a sleeping bag and can keep an infant warm for up to four hours. Each Embrace device costs just $25, and users can “recharge” it simply by submerging it in boiling water. By making it easier for mothers to transport their babies to a hospital, this newly designed incubator has radically reduced the rate of infant mortality in rural areas. What design thinking is good for | Practitioners who use design thinking are better able to understand the people they are serving. They develop the courage to fail and make mistakes, and they learn that they can design their way out of many (if not all) problems. The steps of the design thinking process feel intuitive and natural. In addition, design thinking helps to instill a creative mindset within both individuals and institutions. When people work with a “design mind,” they become more optimistic, more collaborative, and more willing to take risks. Where design thinking falls short | In many cases, the strengths of design thinking are the very qualities that pose the greatest threat to established institutions. And design thinking, on its own, lacks the conceptual and practical tools needed to manage the consequences of that perceived threat. Collaboration, creativity, rapid action, and comfort with failure can also be significantly counter-cultural. In young institutions, people often celebrate this way of working. In more established institutions, however, it can be threatening. When people in those organizations begin to think and behave like designers, they inevitably disrupt the status quo. Sometimes their efforts are so disruptive that they put their jobs at risk. Two core principles distinguish adaptive leadership from other leadership approaches. The first principle is that leadership is available to anyone, regardless of position. The second principle is that leadership is dangerous, unsettling, and even subversive work. Adaptive leadership also emphasizes two core distinctions—the difference between exercising authority and exercising leadership, and the difference between technical problems and adaptive challenges. People in positions of power exercise authority. Authority figures provide direction, protection, and order. No family, organization, or country can survive and thrive unless the people in positions of authority do their jobs competently. Exercising authority is important work, but it has nothing to do with exercising leadership. In fact, leadership is not about meeting expectations; it’s about challenging them. It’s about telling people what they need to hear—especially when what they need to hear differs from what they want to hear. Challenging people’s expectations generates resistance and pushback. That is what makes leadership dangerous. Ask Mahatma Gandhi, or Martin Luther King Jr., or Anwar Sadat. Adaptive leadership focuses on challenges that are not primarily technical. Technical problems are susceptible to clear definition, and they have clearly identifiable solutions. Adaptive challenges, by contrast, are hard to define precisely. Solving them involves changing hearts and minds, and solutions of that kind often threaten people’s self-identity. Take the example of a broken leg. Fixing it might be a complex task, but it’s amenable to the competent application of medical expertise. Now compare dealing with that problem to dealing with a disease like Parkinson’s, multiple sclerosis, or cancer. With those conditions, the work of change falls largely to a patient and his or her family members, who must adapt to a new and unwelcome reality. Adaptive leadership is uncomfortable because it involves helping people through loss. After all, we don’t resist changes that we think will be exciting or good for us—starting a new job, moving to a new city, getting married, having children, winning a lottery. But we do fear and resist the need to leave behind something that we cherish. Part of the work of adaptive leadership, therefore, is identifying the losses that come with any change. 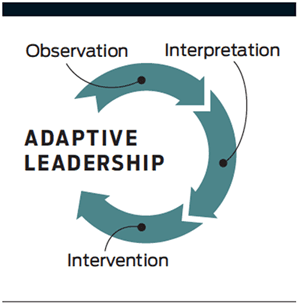 The adaptive leadership process involves three steps: observation, interpretation, and intervention. In the observation phase, people step back from their immediate work in order to see what is happening around them. Adherents of adaptive leadership use the metaphor of “getting on the balcony” to describe this activity: Practitioners, even as they are in the midst of action, must stand apart from the fray so that they can notice larger systemic patterns. A commitment to careful observation was evident in the work that Linsky did with Proskauer Rose, a global law firm based in New York City. The firm had a two-headed governance system that worked well to solve short-run, non-firm-wide problems. Yet that structure also allowed some departments in the firm to become fiefdoms, and it created barriers to cross-firm communication. For that reason, some partners in the firm were working to create a single culture for their organization, but they had been unable to make serious progress toward that goal. Then, at off-site meetings that brought the two governance bodies together, members of the firm began to view the problem through an adaptive lens. And they saw a pattern: Each decision that they had made about structure or process was reasonable on its own terms, but those decisions had cumulatively reinforced a culture that preserved fiefdoms and fostered intense internal competition. The next phase, interpretation, requires practitioners to make sense of their observations. The work of interpretation can be difficult. People will gravitate toward interpretations that are narrowly technical and that favor consensus. They will resist interpretations that are systemic in scope or that focus on conflict and loss. Yet systemic disruption, conflict, and loss are inevitable aspects of real change work. At Proskauer Rose, members of the firm began to understand that they would have to choose between two futures: By staying on their current path, they would protect the autonomy of individual departments and maximize the opportunity for short-run financial gain. By choosing an alternative path—one that involved nurturing a single set of values, practices, and norms—they could create a more inviting work environment and a stronger firm over the long term. In the last phase, intervention, practitioners undertake customized experiments that focus on the human element of the change process. In that vein, partners at Proskauer Rose took a few small, relatively low-risk steps to advance their one-firm vision. They altered how the firm compensates members for collaboration, for example, and they restructured certain legacy departments that no longer aligned with the financial expectations of the firm. What adaptive leadership is good for | Adaptive leadership involves the paradoxical embrace of relentless optimism about the prospect for changing the world and brutal realism about the obstacles to doing so. People who want to lead change often focus on the former rather than the latter. But by retaining a sense of both optimism and realism, practitioners can keep the optimism from becoming naïve and the realism from becoming cynical. The biggest mistake that people make in trying to lead change is that they treat adaptive challenges as if they were technical problems. Adaptive leadership makes it easier to distinguish technical elements from adaptive ones. It also offers tools that equip practitioners to manage themselves as they conduct this risky and difficult work. Where adaptive leadership falls short | Adaptive leadership provides few resources for fleshing out the elements of an imagined future or for devising specific interventions. Many people, moreover, find that adaptive leadership offers little in the way of excitement or inspiration. Alongside managing the loss, pain, and fear that often come with change, practitioners need to engage people by providing a sense of fun, a spirit of collaboration, and visible signs of progress. At Proskauer Rose, adaptive leadership was essential to enable members of the firm to identify and confront the choices that they faced. Yet adaptive methods were not enough to help them generate innovations that would fundamentally recast how they did business together. Each of these areas of practice—design thinking and adaptive leadership—features strengths that have the potential to compensate for the weaknesses of the other. 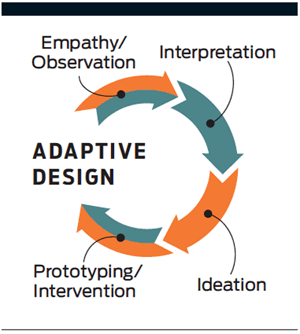 In our work, we have begun to combine these well-established practices into the emerging practice of adaptive design. Broadly speaking, practitioners can pursue adaptive design by following one of two approaches. In the first approach, practitioners move rapidly through cycles of both design thinking and adaptive leadership. Here, the two practices complement one another at various phases of an iterative, overarching change process. Typically in this approach, practitioners begin with design thinking. They employ principles such as empathy and definition to gather data about an organization and its capacity to accommodate new ways of thinking and functioning. In doing so, they can generate the excitement—and the political capital—needed to tackle systemic problems. But the design process will also reveal issues that require the tools of adaptive leadership: observation, interpretation, and intervention. After practitioners analyze a situation from an adaptive perspective, they can shift back to the use of design thinking, which offers tools for solving tough political and psychological problems. In the second approach, practitioners integrate design thinking and adaptive leadership to create a distinct process that blends and alternates the phases that make up those two practices. The first phase consists of “empathic observation.” It draws on the empathy mode of design thinking and then, in the spirit of adaptive leadership, applies that empathy work to an analysis of the relevant institutional environment. Through a practice called “political mapping,” practitioners review the values, alliances, and perceived threats that pertain to each stakeholder in a given organization or system. The second phase draws primarily from the interpretation mode of adaptive leadership. Here, practitioners distinguish technical problems from adaptive challenges, and they work to discern the value conflicts and the apprehensions about loss that affect various stakeholders. In doing so, however, practitioners also employ tools from the definition mode of design thinking: They use concrete language, for example, to pinpoint adaptive challenges and to frame each challenge as a creative opportunity. In the final phase, practitioners develop “prototype interventions”—experiments that not only test potential new products and processes, but also reveal the ability of an organization or system to accommodate change. In adherence to the design thinking process, members of the team started their work in an empathy mode. They visited multiple classrooms, studied how students and teachers use classroom space, and conducted interviews. Then, shifting into a definition mode, they framed their challenge in this way: “How might we create spaces that support special needs students in an integrated classroom setting?” Following an ideation phase, the team picked one classroom to serve as a prototype and physically redesigned the space with input from teachers and students. The new design included additional workstations that made it easier for students to learn in small groups or in one-on-one sessions with a teacher. There was also a “chill out” area in the back of the classroom. The entire redesign process took just a few weeks, and people throughout the school were enthusiastic about the result. Next the team returned to an empathy mode. Through that process, team members came to see that the school could fully serve special needs students only if it equipped teachers with tools and tactics for working with those students. So the team redefined its challenge as follows: “How might we better prepare faculty to support students with special needs?” After some ideation, team members concluded that the school should revise the way that it handles teacher training. Traditionally, the school had brought in specialized personnel to work with special needs students. Team members believed that the school should go further by giving teachers a baseline set of skills to manage and support those students. At the beginning of each school year, the school conducts a week-long faculty orientation event, and the team decided that this event would be an ideal occasion to provide additional training on this topic. The team created a prototype version of an orientation schedule that prominently featured material on supporting special needs students. The team shared the prototype orientation schedule with the head of school. She had fully supported the classroom redesign effort, but this time she shot down the team’s idea. Members of the team felt deflated and devalued. They also felt stuck. Design thinking had generated the insight that in order to help special needs students, they should work with teachers. But design thinking didn’t provide the resources that they needed to overcome the new obstacle. Members of the team regrouped and began to pursue an adaptive design approach. They again conducted empathy work, but they now employed tools from adaptive leadership as well. Using the “political mapping” tool, the team identified all of the school’s stakeholders: the head of school, other administrators, the board of directors, the faculty, students with special needs and their parents, mainstream students and their parents. The team then explored questions about what motivated people in each stakeholder group: What do they value? To whom are they loyal? What are they afraid of losing if the plan to redesign the teacher-training program moves forward? The team also adopted an adaptive leadership tactic called “partnering with authority.” Through that tactic, people who lack authority ally strategically with those who do have authority over a given system. In this instance, the team met extensively with the head of school and gained a new understanding of the multiple pressures that she felt. Crucially, team members learned that she saw faculty professional development as falling within her purview. They learned that parents were divided about how deeply, and at what pace, the school should integrate special needs students into mainstream classroom activity. Some parents of mainstream students worried that efforts to support special needs students would detract from their children’s academic advancement. The head of school felt a tension between meeting the school’s ideal of inclusivity and serving its commitment to academic rigor. The team was ready to enter the ideation phase again. But this time, as team members began to review their ideas, they did so with an awareness of the interests that motivated various factions within the school. They looked for ideas that would not be threatening either to the head of school or to teachers. Ultimately, they focused their attention on ideas related to teacher education and teacher appreciation. Next they designed and implemented two prototype interventions. First, they created a brief, visually engaging manual with tips on how to support special needs students. Significantly, they shared the manual first with the head of school and then, after receiving her approval, with the entire faculty. And second, they persuaded the head of school to create a “perks” program for teachers. The perks were modest—Starbucks and Amazon gift cards, birthday parties in the teachers lounge, notes of appreciation—but they had a noticeable effect. The school, teachers now say, clearly values and supports their work with special needs students. People throughout the school, meanwhile, have shown a willingness to tackle the broad challenge of balancing inclusivity with academic rigor. First, operating within the framework of adaptive design involves real work. It requires practitioners to learn two complex areas of practice instead of just one, and it entails moving between one approach and the other. Second, adaptive leadership and design thinking tend to appeal to different types of people. Adaptive leadership resonates with those who like to think about the psychological and political elements of change—those who prefer to focus on the human dynamics of a change project rather than on its content. Design thinking resonates with those who like to think about the work at hand and who want to get things done quickly. Adaptive design inevitably tests the flexibility of people in both camps. It pushes them, at various times, to the edge of their comfort zones. Third, and perhaps most important, practitioners can use these practices together effectively only when they concede that neither design thinking nor adaptive leadership alone is sufficient to solve complex social and organizational problems. Design thinking adherents tend to believe that the design process encompasses all of the essential ingredients in adaptive leadership. They are apt to claim that real empathy work and high-quality definition work can furnish the same insights that adaptive leadership contributes through observation and interpretation. They also tend to assume that results are what ultimately drive meaningful change—that people will come along for the ride once they see what design thinking can achieve. Adaptive leadership adherents tend to believe that their ability to diagnose a system—to reveal the skeletons that lurk in the closet of an organization—is what ultimately enables people to be more effective in their work. People in organizations, those adherents argue, have the technical expertise to do their best work but lack the ability to notice the blind spots and deeply held commitments that get in their way. The effective use of adaptive leadership tools, in short, frees people up to do their jobs well. For adaptive design to flourish, both the adaptive leadership practitioners and the design thinkers will have to start by acknowledging that neither has all of the answers. Indeed, in working to develop this synthesis, each of us had to give up something—some piece of our original practice that had worked for us in the past. Without knowing it at the time, we were practicing what we now try to preach! Despite these challenges, we believe that adaptive design combines the best of both practices and minimizes the weaknesses in each of them. Adaptive design provides a set of principles and tools to help practitioners achieve the promise of innovation while also navigating the cultural and political ramifications of change. 3 Tom Kelley and David Kelley, Creative Confidence: Unleashing the Creative Potential Within Us All, New York City: Crown Business, 2013. 4 Tim Brown and Jocelyn Wyatt, “Design Thinking for Social Innovation,&rdquo; Stanford Social Innovation Review, Winter 2010. 5 Ronald A. Heifetz, Leadership Without Easy Answers, Cambridge, Mass. : Harvard University Press, 1994. 6 Ronald A. Heifetz, John V. Kania, & Mark R. Kramer, “Leading Boldly,&rdquo; Stanford Social Innovation Review, Winter 2004. 7 Ronald A. Heifetz and Marty Linsky, Leadership on the Line: Staying Alive Through the Dangers of Leading, Boston: Harvard Business School Press, 2002; Ronald Heifetz, Alexander Grashow, and Marty Linsky, The Practice of Adaptive Leadership: Tools and Tactics for Changing Your Organization and the World, Boston: Harvard Business Press, 2009. 8 Chris Ertel and Lisa Kay Solomon, Moments of Impact: How to Design Strategic Conversations That Accelerate Change, New York City: Simon & Schuster, 2014. Maya Bernstein is a consultant based in New York City. She is also a cofounder of UpStart Bay Area, a nonprofit accelerator that supports innovation in the Jewish community. Marty Linsky is a cofounder of Cambridge Leadership Associates and an adjunct lecturer at the Harvard Kennedy School. Disclosure: Marty Linsky worked with Tim Morehouse on a pro bono basis, and he worked with Proskauer Rose through Cambridge Leadership Associates. Maya Bernstein worked with the private school in New York City through the Day School Collaboration Network, an initiative led by UpStart Bay Area in conjunction with the Jewish Education Project, a nonprofit organization based in New York.